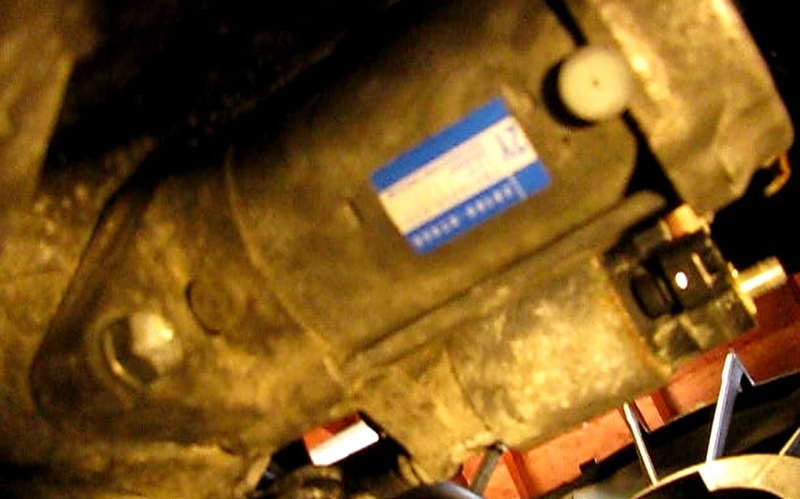 This post will cover removing and replacing the starter in a 2010 1.8L Toyota Corolla. 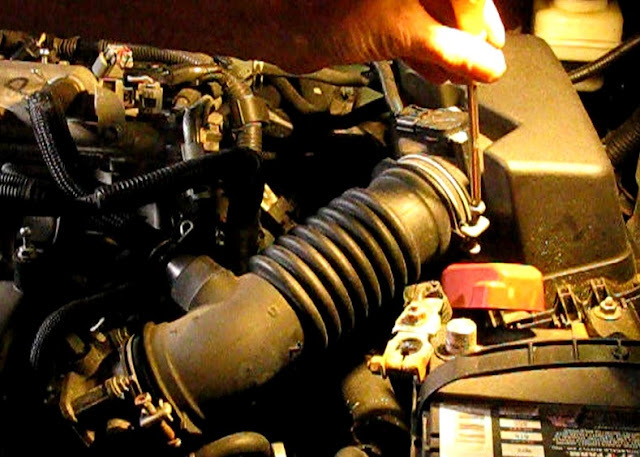 This is not a difficult starter to replace for the average home mechanic. There are two 14mm mounting bolts for the starter, 180 degrees apart. The lower one is easily accessible but the top one is so close to the dipstick for the transmission that it is very difficult to get tools in there. The good news is that it is easy to remove and get out of the way. 2) Jack up the front end and put on supports. A floor jack works great just behind the hook under the middle of the front of the car. Solid supports for the jack stands are just inside of the lower control arms on both sides. 3) Remove the intake cover. It unsnaps from three ball headed bosses at the corners. 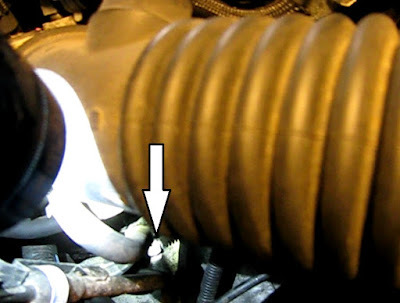 4) Remove the big air intake hose. This will give access to the upper starter mounting bolt. Loosen the two hose clamps holding the air intake to the air intake plenum and air cleaner. Remove a hose coming in to the left side of the assembly. Then the hose can be lifted up and set out of the way. These intake hoses are always in the way. Get it out of there! 5) Unbolt the bracket holding the transmission dip stick and cooler hoses from the front of the engine. Clean any debris from around the bottom of the stick holder where it goes into the transmission. Then the stick can be moved enough to allow removal of the top starter bolt. The top bolt can be removed from above and the lower from below or above. 6) Break the upper bolt loose with a 14mm deep well socket, a 3/8 to 1/2" socket adaptor and a 1/2" ratchet. 7) Unwire the starter. Unplug the solenoid control wire. Then unsnap the plastic B+ cover and unbolt the B+ nut with a 12mm 1/4" drive socket and ratchet. 8) Break the lower starter mounting bolt. 10) Remove the lower mounting bolt while holding the starter and as it comes loose ease it down between the splash shield and frame. 1) With a bolt in one hand, bring the starter up from the bottom and seat in the flywheel opening. Get the bolt started by rotating the starter until it catches in the bolt hole. Turn it in by hand for now until it is flush. 3) Mount the top bolt by hand as far as possible and then snug it up good with the 14mm deep well socket. 4) Turn the lower bolt in to final torque with the 14mm socket. 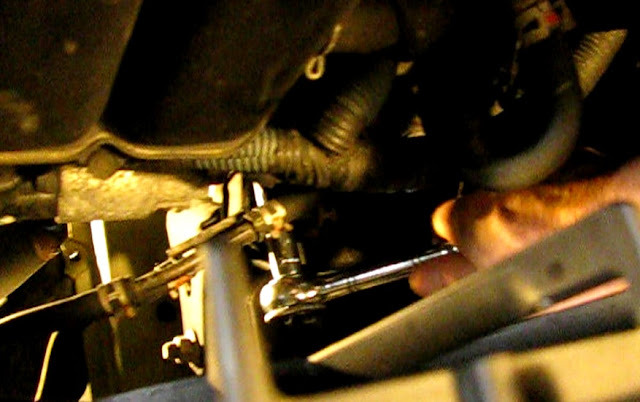 5) Re- seat the transmission dipstick and mount the bracket with the 12mm socket..
6) Re-mount the air intake hose. Don't forget the small hose coming in from the left. I would test the starter before remounting the large lower splash shield, no? Sorry, that's actually a mistake. There is no large splash shield on this car. I will correct that.